The classic show tunes of Lerner and Loewes "My fair Lady" rang through the Sultan High School Commons on Wednesday night as the cast, ensemble and crew ran through a final, full dress and technical rehearsal. 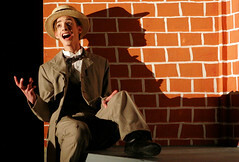 The much-loved show, inspired by the classic 1916 Bernard Shaw play "Pygmalion" is produced and directed by Sultan Highs music teacher Mrs. Jill Sumpter. Mrs. Sarah Harkins is the technical, scenery and drama advisor. A highlight of the lavish production are the sumptuous period costumes,left,that lend a professional air to the show. The large cast looks authentic and comfortable in the detailed costumes. The "Ascot" scene in particular stands out with the Singing/Dancing Ensemble massed on stage, all in lush black and white fancy dress . The protagonists in this battle of the sexes, Andrew Murray as Henry Higgins, Jenny Stone as Eliza Doolittle and Pat Santerre as Colonel Pickering, act, dance and sing well, sharing their obvious joy with the audience. Colonel pickering, Pat Santerre, acts as a foil to the opinionated Henry Higgins. It is fun to watch Eliza blossom from Covent Garden flower girl to Society star. The signature, "On the Street Where You Live" sung by Drew Wetzel, right, as Freddie Eynsford-Hill is delivered in a charming, quavery, high voice that is completely in character as Eliza Doolittles young suitor. All of the singing is polished and the choreography moves the story along. A show stopper is “Get Me to the Church On Time” performed by Cody Young as the witty, Cockney Alfred P. Doolittle, Elizas father. The Ensemble provide great dancing and chorus for this rousing number. The production is boosted by the Pit Ensemble, supporting the singing and dancing, and providing scene change interludes. The band features a strong horn section. Interesting production touches are having actors enter from behind the audience, small scenes done in front of the curtain during scene changes and characters exiting off stage, through the Commons. These production features add up to an enjoyable, well done evening at the theater.